`Blues', pink flowers with rose markings. b‘Freckles’ (pink with red spots and white “eyes”) Winner All-America Selections 1991. `Polka', a carmine color with a purple cast. ‘Starburst Red’ is large flowers, white florets with streaked with scarlet. 1995 FloraStar winner. `Jeanne d'Arc', lavender with dark stripes. Cascade hybrids are more appropriate than ivy types in regions where hot. 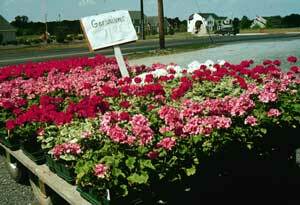 They are bred for container growing and to handle heat and humidity. They have a compact, trailing habit and bloom irrepressibly. `Queen of the Whites', single white flowers.